Ngọt như đường cát, mát như đường phèn. Sweet as sand sugar (refined sugar), cool as rock sugar. 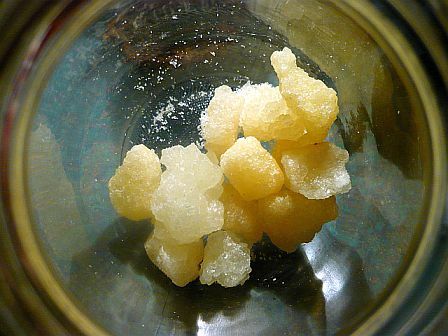 Known in English as rock sugar or even rock candy, đường phèn can be white or golden. The second time I returned to Canada from Việt Nam, my mother-in-law packed a big bag of đường phèn for me to take along. She told me to use it to make chè (sweet soupy desserts) with the fresh lotus seeds that she’d already stuffed into my baggage. It’s also one of the secret ingredients for making a phở broth beyond the ordinary. My husband’s gradmother, whom we call Mệ, likes to nibble on chunks of rock sugar while sipping strong green tea. This sugar is a specialty of Quảng Ngãi province, a major sugar cane-growing region. 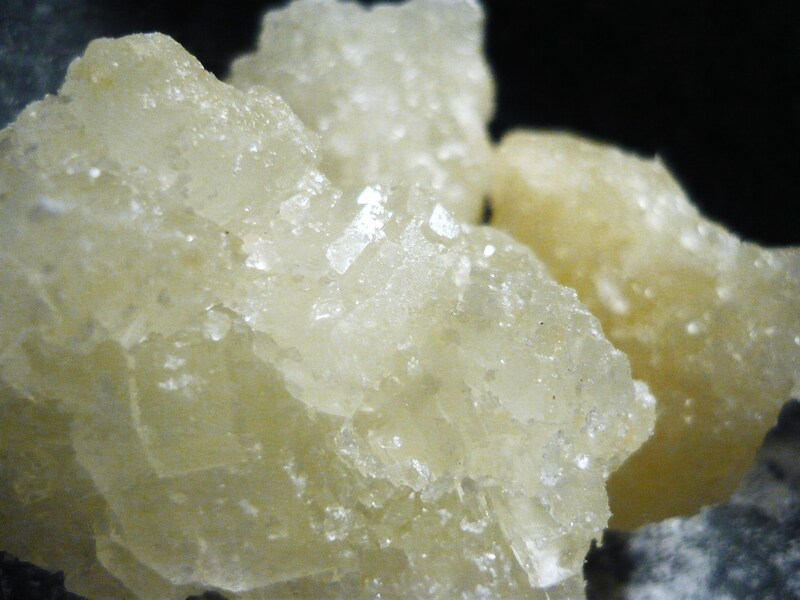 Rock sugar is traditionally a popular gift for close friends or family, especially if they are setting out on a trip. She usually buys regular, white refined sugar, or đường cát trắng. The crystals are a little larger than we are used to in the West, so it doesn’t dissolve quite as readily, but the taste is almost the same. Because it’s refined, it has no (or few) impurities and it’s what you’ll get with your iced black coffee and what most Vietnamese cooks use at home. 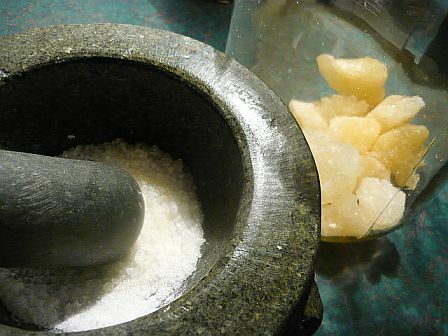 My mother-in-law says the rock sugar is special and she rarely buys it, but she remembers that when she was small, refined sugar was expensive and cherished, while rock sugar was looked down upon. Rock sugar still has the delicate, smoky flavour from the cane, which is why it’s so good in phở. It’s not a flavour you can pin down; just a mysterious “something”. It works for Huế Beef Noodle soup and for other soups too. I use đường phèn whenever I need caramelized sugar for a dish. It melts and caramelizes quickly, whereas refined sugar seems to take forever. I’ve even had it refuse to caramelize at all. Đường phèn comes through for me every time. And then there’s that wonderful flavour. I take the sugar off the heat while it’s still golden and it continues to darken a little more, but not so much as to lose that flavour.I use the caramelized sugar most often for making “kho” dishes; foods that are finished in a fish sauce and caramel mixture. Once in a while, I use it for flans (crème caramel). If using Vietnamese rock sugar to make chè, the sugar can be dissolved and filtered first, to remove the cane fibers. For “kho” dishes and for soups, this isn’t necessary. 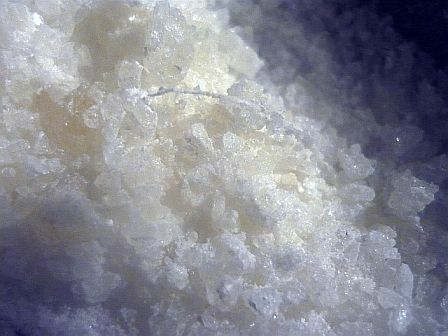 In the West, rock sugar can be purchased from most Asian markets. Don’t confuse it with the brown or golden discs of palm sugar. (These are made from Toddy Palms, and have a different flavour.) The sugar I get from the market in Huế comes in jagged chunks roughly the size of golfballs, but I’ve seen it sold as smooth grape-sized pieces in Montreal’s Chinatown. This sugar appears to be harder, drier and almost transparent compared to the one I’ve been using. I’ve never tried it though, as I’ve never run out of what I bring back from Việt Nam. This entry was posted in A to Z, Cooking, Food, Photos, Viet Nam and tagged rock sugar, sugar, đường phèn. Bookmark the permalink. Always impressed by your insider’s knowledge of Viet Nam and its cuisine! Love the numerous kinds of sugar available for cooking. In the UK, the supermarkets have over half a dozen kinds of sugar and all the recipes are very specific about what to use. Here in the US, it’s just sugar, brown and white. 😦 There is something so lovely about rock sugar. And thank god for ethnic groceries (I went to three just this morning, Indian, Korean and Japanese). Same here in Canada, but I’ve noticed lately that more varieties are appearing on the market. Raw sugar has been available for some time, along with Demerara sugar and Turbinado, confectioners of course, and fruit sugar in some specialty places. Corn sugar is also always available at brew-your-own beer supply shops. It’s nothing compared to Viet Nam though. In the markets there, I’ve seen up to 15 or so different sugars sold by one person. There’s even a “black sugar”, which looks something like a crystallized molasses. Corn sugar! Great photos btw. You put my food knowledge to shame, Chris! My mother-in-law would love you. And how cool to give rock sugar as a gift. I like that. Aw, thanks Kari! Yeah, it is a nice gift, but I had a hard time explaining to my mom-in-law why my father wouldn’t need any. Finally had to take the package anyway, and add it to my own stockpile. My baggage was *really* heavy on that trip. Rock sugar in phở, huh? It took me years to wheedle the recipe from my mom (she doesn’t use measurements and apparently ingredient lists are optional too lol) & she never mentioned rock sugar. I can see how that caramel-y flavor would work in phở tho. Will have to try it with my next batch cuz soup season’s just around the corner :). I think a lot of people just use regular sugar in their broth, and then there are those who use none at all. I do find that it smoothes and balances the flavour of the other ingredients though. If you try using rock sugar, please do drop by and let me know what you think! Was the rock candy you ate as a child just pure sugar, or did it come in flavours? I remember hearing about it years ago, but we never had it when I was little. Then when I first heard of rock sugar being called rock candy, I was surprised to learn that it was just sugar. I’m guessing it was just plain sugar, I only remember it as white. Wonderful, Chris. Thank goodness for those who help us keep tradition alive. I used to wonder the same thing, but have since learned that there are certain dishes which improve with the addition of some sugar. We’re not talking about adding a lot, certainly not enough to make the dish sweet, but just a little can round out rough edges and cut acidity. It can even help balance a dish that is too salty. In the case of the ‘kho’ dish I mentioned above, using rock sugar and fish sauce produces a thick, somewhat sweet sauce which is also a glaze. One of my fave Vietnamese cooking techniques. As for rock candy, I wonder if anyone eats it anymore. It seems to be something people remember, rather than something people eat now. My father used to buy us barley sugar candy, also rock hard but clear. This looks so beautiful — thanks for the introduction! I’ll keep an eye out for it. Hi Theresa, thanks for reading. Let me know if you try it! Ooh, that looks lovely — never tried rock sugar but will keep an eye out. We used to eat Barley sugar, my mother loved it and would buy us sticks. My grandfather would burn sugar and treacle into treacle toffee but I didn’t get to learn how he did it. That might be something I look up. Mmm, maple syrup…my friends in Viet Nam didn’t know what to make of it the first time I brought them some, but now some of them are addicted. My dad used to buy us barley sugar candy.100% sweetness. I’ve heard about treacle toffee; thought it was a British thing. Is it no longer popular or can you still get it?